NEW YORK – December 15, 2014 – Nickelodeon’s new hit preschool series, Dora and Friends: Into the City!, starring the world’s most beloved explorer makes its DVD debut on February 10, 2015. 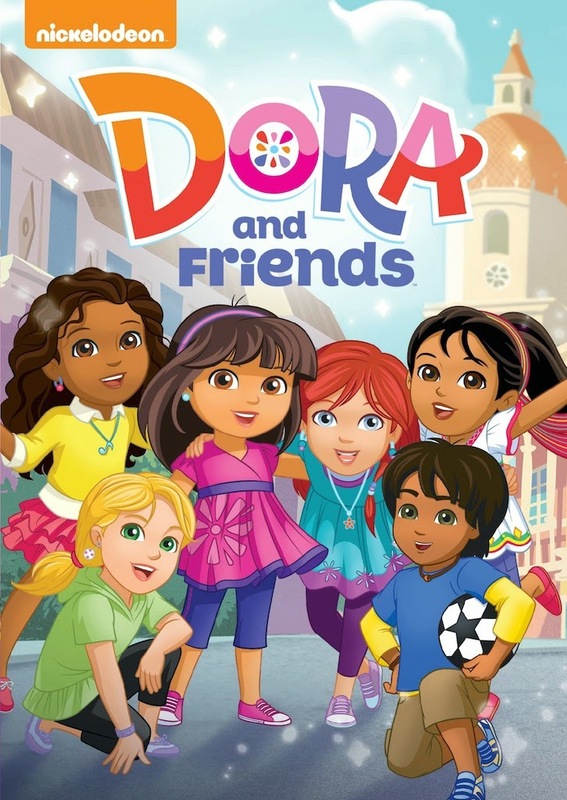 Dora and Friends features the iconic character Dora living in a city, attending school and at the center of a peer group that works together to give back to the community--having both real-life and magical adventures along the way. The Dora and Friends DVD collection takes viewers on four music-filled adventures with Dora and her new group of friends – Kate, Naiya, Emma, Alana and Pablo – who share her passion for learning and exploring. The series features an interactive curriculum focusing on community service, problem solving, emotional skills, Spanish language and Latino culture. Created by Nickelodeon and distributed by Paramount Home Media Distribution, Dora and Friends arrives on DVD on February 10, 2015, for the suggested retail price of $14.99. · We Save a Pirate Ship! - Dora and her friends are at a Pirate Festival to benefit the restoration of the city’s ancient seaside fort, and Dora promised a little boy named Jorge that he could steer the festival’s pirate ship ride. But when the pirate ship ride doesn’t show up, Dora, Kate and Pablo must build their own. They find an enchanted ship’s wheel that takes them to a talking pirate ship with secret treasures. · The Magic Ring - Dora and Naiya are helping out at story time with the younger kids at school when Pablo discovers a mysterious ring that shrinks him. Dora and Naiya search through the library and find the secret of the ring, discovering that it's been stolen and lost by an evil wizard from long ago. The only way the spell can be broken is by putting the ring back on the owner's finger, an ancient princess. · The Royal Ball - Dora and her friends are having a Royal Ball in honor of all the kids who helped clean up the city park. Dora and Alana head to the costume shop to get dresses, and find a golden gift box with a beautiful dress that’s perfect for Alana. The golden box comes to life and tells them that the dress is for the princess – it's his job to get it to her! The box magically transports them to the royal grounds where they must escape a dragon and rescue the box from crocodiles. · Dance Party - Dora and her friends are putting on a dance party to raise money for the town’s new dance school. Alana convinces Pablo to teach her a simple step as a mirror ball magically transports them and Dora to the land of Baila, where they meet Celia. She explains to them that her overprotective father, the mayor, has outlawed dancing after she stubbed her toe at her first dance. Celia needs Dora and her friends’ help to convince the mayor that dancing is safe and fun.